Alex is on fire! Oh, I mean #CatchFire! I am so very proud of Alex J. Cavanaugh, blog guru of the blogosphere. Something that amazes me is how he manages to balance real life (work, wife, family and more) with his writing career, blogging and keeping up with social networking. I know it is a lot of work, my having four kids and all, so he's my authorly hero! The Vindicarn War is a distant memory and Byron’s days of piloting Cosbolt fighters are over. He has kept the promise he made to his fallen mentor and friend - to probe space on an exploration vessel. Shuttle work is dull, but it’s a free and solitary existence. The senior officer is content with his life aboard the Rennather. The detection of alien ruins sends the exploration ship to the distant planet of Tgren. If their scientists can decipher the language, they can unlock the secrets of this device. Is it a key to the Tgren’s civilization or a weapon of unimaginable power? Tensions mount as their new allies are suspicious of the Cassan’s technology and strange mental abilities. Book trailer available at http://www.youtube.com/watch?v=Qa6VINRGtyE. Head on over there and congratulate him. Enter to win, too! Welcome to Teen Author Boot Camp where you will interact with rockin' authors, and learn their writerly secrets! Who? Teens ages 13-19, NO ADULTS ALLOWED! Here are just a few authors who braved their faces! reposted: Why are We Neurotic? I've just proved my point at how crazy it's been. I had accidentally posted twice Wednesday last, and had meant to post this one today. Ugh. I hope you can pat me on the head and say it's okay for having read this again. The article I posted the other day talked about how many authors are switching to Amazon for the publication of their books and how the publishers feel threatened. Something I read on there has had me thinking. The publishers are a bit smug, saying that Amazon won't know how to deal with neurotic authors calling them at all odd hours of the day. Neurotic they say? That makes my skin crawl. Does the writing industry realize how authors come to be so neurotic? It's funny, I have to admit, but it's because of the red tape system and all the rejections we face at every angle (from red ink all over our manuscripts, the query/agent/editor/publisher trek, editor and MS fixes, bad reviews, waiting, waiting, waiting--even after being published we still face rejections! ), it is no wonder why we are neurotic! *An author is not neurotic, your Highness, and those who are cannot help themselves. Really! Well then by all means, enlighten us. If you (agent, publisher--anyone in the writing industry) suffer your authors to be rejected, and their manners strained from infancy stage of writing, and then punish them for those strains by rejections to which their first introduction to publishing disposed them, what else is to be concluded, sire, but that you first make neurotic authors and then punish them? The main reason I write this post is because of the way it was phrased in Bloomberg's article--it felt smug of them to say that we are neurotic. What are your thoughts on how writers are forged to be the way they are? 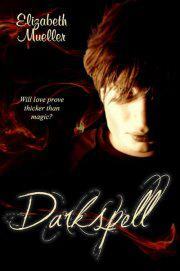 #FREE #Darkspell all weekend. How? Read on! Growing up in an abusive home wasn't easy for me--I hated myself and wished for darker things. I found hope and became strong when I realized how loved I really am. Please Share the Aware with Mybeauty-intensified for suicide prevention! All "likers" will get a FREE e-copy of Darkspell ALL weekend long, including President's Day! I've hit a wall where the balance has tipped and my family and spirituality has suffered--I especially felt that right after my Debutante Ball. I held a panel at LTUE's Paranormal Romance: Injecting Romance into Ghost Stories with moderator Elana Johnson. I worked up a ditsy storm because of my anxiety the entire day up to the time of my appearances, then I crashed hard after my reading, which proceeded the panel. Not a pretty sight because I kept losing things. See my mysterious black gown? That's my Wanda dress. 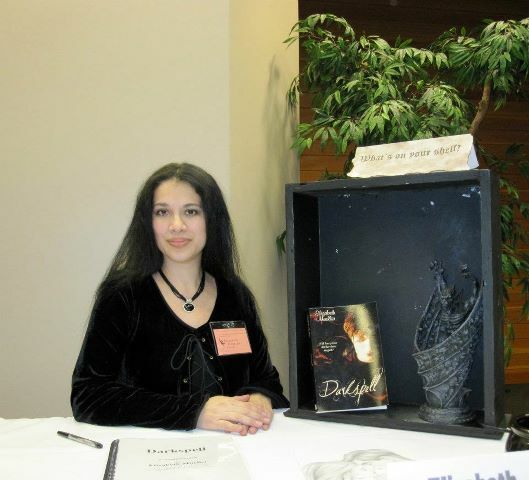 Wanda is one of the main characters from Darkspell. She's the guardian of the Stormhold Coven, the necklace is the talisman that she gives to Winter for protection against the Shadoweaver. I dressed in character for my reading and used voices and facial expressions. It was such a pleasant surprise to see Brenda Sills at LTUE! Do you like my book signing display and getup? 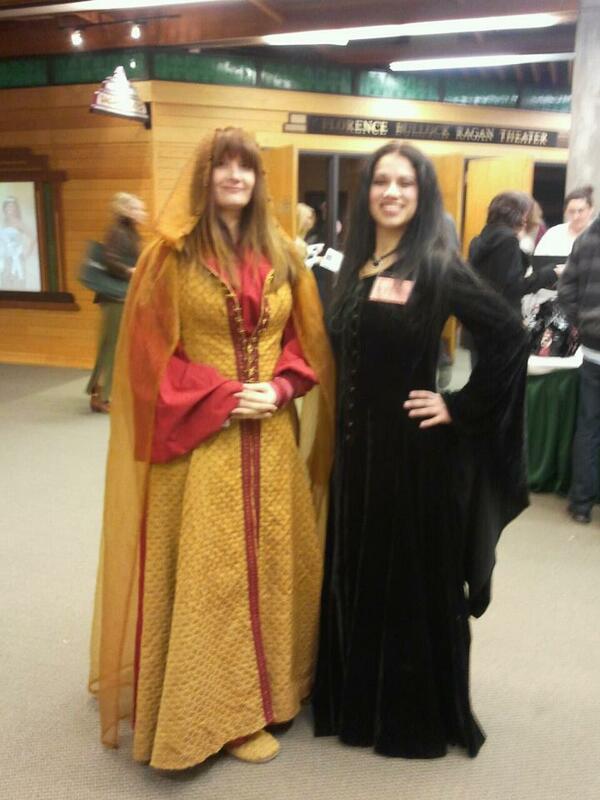 Lynn and I decided to dress in character for the book signing! My baby at the UVU bookstore! 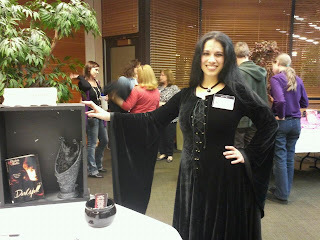 My first book signing ever at LTUE. This one was cool because everyone that went was a writer--so easy to strike up conversations when you know you have something in common with a person at a signing. Paul Genesse is one of the coolest authors I've ever met. Donna Weaver and Konstanz Silverbow eating lunch at LTUE's cafeteria. It was enjoyable, seeing old friends, making new ones, and chatting with potential authors who share the same obsessive love of writing. I usually go camera crazy, but I didn't this year. I only took what I could when I could--it was really busy. 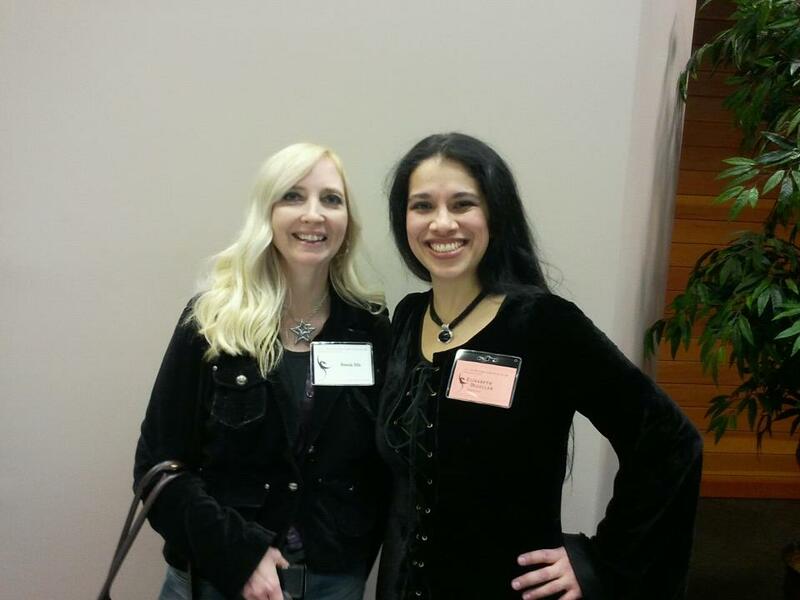 Have you been to a writers conference? How was it like for you? Right now, as you comfily read this post on your snuggly couch, I am in a whirlwind of authors, aspiring authors and readers as well as people who just love to learn. This is my first writers conference ever that I will be a panelist in. Am I scared? Yes. Standing in front of dozens of people makes me feel weak as water! Okay, I know water can be very strong, but I am not there yet! I am also doing a reading out of Darkspell! I've been reading books out loud for fifteen years--because I'm a mom, and I have read out loud at book readings to very small groups. I've read to a large group a picture book at an elementary school using silly voices, but maybe only four people will show up to my reading here. What do you think? I think a tip is keeping in mind my audience. LOL. We'll see how it goes. So, where is this writers conference you ask? It's LTUE! 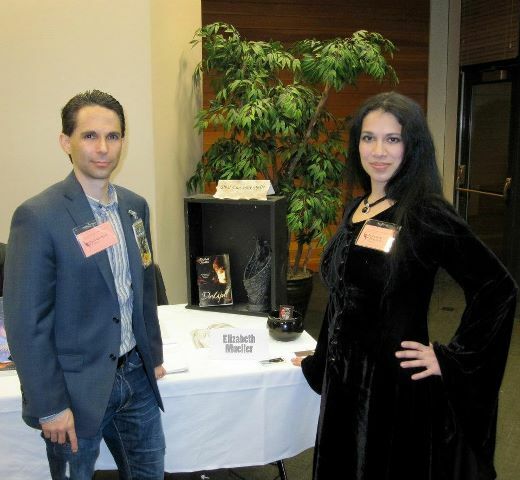 I attended this conference when I was only aspiring to be an author a few years ago. Interesting how now it's reversed! 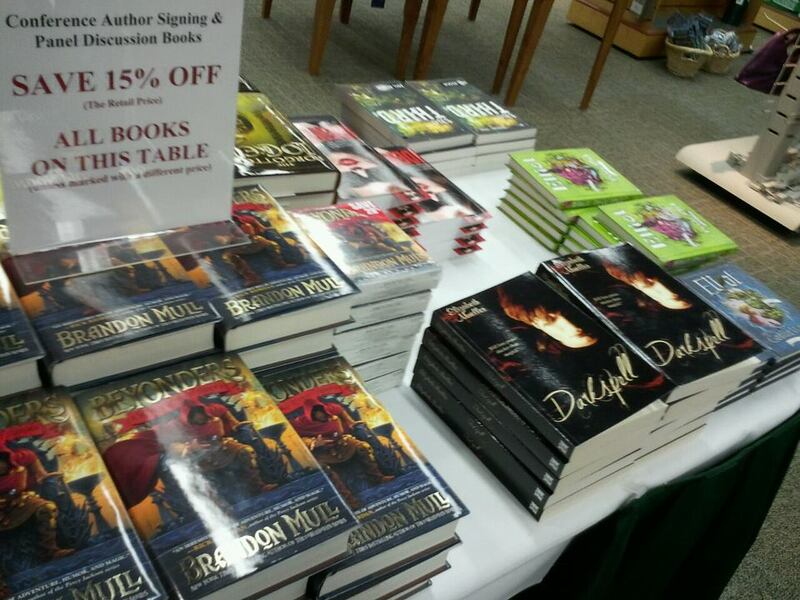 The next wind will sweep me away to my first book signing at the Gateway Barnes & Noble Saturday the 11th! A dear friend of mine was thoughtful enough to invite me as one of the several authors attending. I am so thrilled. Am I scared? Not really. I find presenting the worstest of scaries. But with a powerpoint, the universe is mine. What is your scary exciting moment? coming up: how my weekend at the conference and book signing went! Aaa! So I started outlining my alphabet for April! At first, I was going to base my theme around being a writer, but I did that last year! Then I stole the idea from my gorgeous 9 year old who's doing Utah Studies from A to Z! So every night, she and I have been jotting down notes and "copying" each other. What a fabulous experience and bonding opportunity for us. I am having lots of fun with this! I need 8 more alphabets to go and then I get to start writing out my posts! I am posting an image along with its source as well as a few links about the subject matter I can get to when I am done "staging" my ABCs. I've had someone ask me if I plan to capitalize the featured letter with its color. My answer: of course! That was part of the funnest thing I did with my challenge! If you want to steal my idea, I welcome it! Hmmm, me thinks it looks like a cypher of sorts! I hope that helps some. I know last year I had accidentally skipped a day (since we don't post on Sunday but for the 1st for this year), and I had to go back through every scheduled post and redo the dates. Ugh. Not fun, let me tell you! I've tossed the gauntlet, do you think you're up to accepting the challenge? Yes? Sign up here! Please? Help us reach 1000 at Twitter! But it's Tradition . . . NOT! Bloomberg Businessweek sent me my weekly subscription. It had me reeling: "Amazon's hitman, a tale of books, betrayal, and the (alleged) secret plot to destroy literature" which refers to Amazon's Larry Kirshbaum. Is he really seeking to destroy literature? I think it's a matter of perspective. Check out amazing graph here.
" 'Publishers are selling drinks on the Titanic,' says Joe Konrath. 'They are doing so much to protect their paper industry that they are disregarding the needs of customers and are treating authors poorly.' Konrath was once a struggling mystery writer living outside Chicago with hundreds of rejections to his name, nine unpublished novels, and a tempestous relationship with the publisher of two of his books, Hyperion. Then two years ago he started experimenting with uploading those books directly to the Kindle marketplace. Now, under the name of J.A. Konrath, he says he's making about $4,000 a day and collecting a &) percent rolaytly on every book he sells." Publishers resent the fact that Amazon is *stealing authors from them. "I sometimes think publishers are the pimps and writers are the prostitutes. Publishers have fancy names and fancy promises but it's the writers who bring in the loot, with the publisher getting a lion's share for looking good. My hub's in the corporate world, a minnow in a sea of big fish, so to speak. He says that in the corporate world publishers are the vendors and writers are the clients, with the latter having the power. But this has been turned around, with the latter having to say 'how high' when the publisher says jump. " Hmmm . . . One might question if this is a passing fad or the sign of the times. It's no wonder more and more authors are turning to self-publishing. Does this mean that those of us who are opting self-publishing are destroyers of literature as the Bloomberg's title states? I think not! Authors are creators of literature, whether they choose Amazon or the traditional publisher. Were you aware of all this muck going on in the book world? Where do you stand on this? *My personal thoughts regarding this article. First, I open my list of A to Z bloggers. Going down the list, and by hovering my mouse over each blogger link with my left button down, I drag it up to the browser tab. Do that for as many bloggers as you plan to visit that day/session. Now, I whip out my timer and set it for fifteen minutes, so that's fifteen blogs for me. Yes, it takes me a minute per blog--I don't frivol away my time because it's precious to me! Important: Do not hit "publish" for any of your comments until after your timer rings. After it goes off, then go back and publish all your comments. Note: For the pop-up window comments requiring the anti-spam code--you do not need to hit "publish", rather, just hit enter. (A time saver thing I've learned). Do you have any blogging short cuts you'd like to share with us?